Common Breads Are Made With Chemicals Found In Yoga Mats! Bread is commonly brought up in conversation as the cause of many health issues (specifically, the reason you can’t lose that last 10 pounds). Bread gets this bad rap because grains, in general, are not easily digested by our bodies, can inhibit the effectiveness of your pancreatic enzymes, contain anti-nutrient phytic acid and, worst of all, a whole lot of gluten. In Western society, people tend to over-consume carbs on a daily basis. There is refined carbs in almost every meal. Someone consuming a typical Northern American diet probably has at least one form of grain for every meal (bagels, cereal, sandwiches, pizza, pasta etc.) . Many of the most commonly consumed forms of grains aren’t even considered healthy regardless of the various digestion-related problems associated with grains. They are full of ingredients that are commonly used in products other than food, like azodicarbonamide (a chemical that is found in yoga mats and shoe rubber). Flour can be treated with a variety of chemicals approved by the FDA before it ends up on store shelves—including chemical bleach. Also, the industrial processing destroys nutrients such as fiber. There should only be 4 ingredients to make bread—flour, yeast, water and salt. Any additional ingredients is added to serve a purpose other than satisfying your hunger. 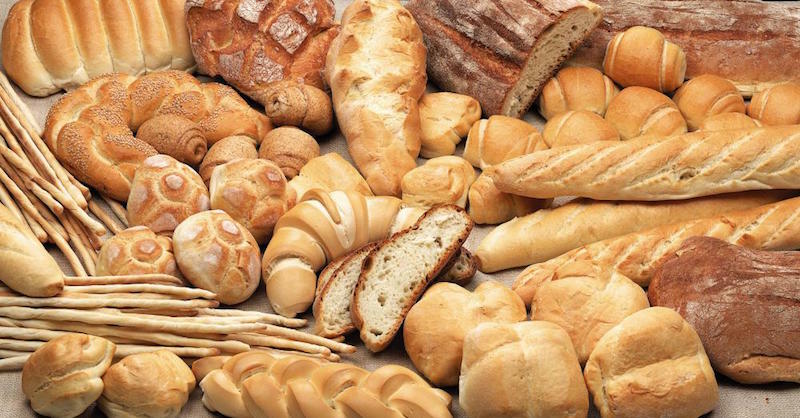 Dough Conditioners: The only purpose of dough conditioners is to make the process of making bread faster and cheaper for the food industry. Many dough conditioners like azodicarbonamide, DATEM, monoglycerides, diglycerides, sodium stearoyl lactylate are linked to health issues. Preservatives: Preservatives like calcium propionate are linked to disorders such as ADHD. GMO: Most commercially available breads contain one or many genetically modified ingredients, including various soy products. Artificial sweeteners: It is not bad to use natural sweeteners such as honey to sweeten your bread, but most manufactures are using high fructose corn syrup or other artificial sweeteners that can pose numerous health risks. Majority of commercially-baked brands have some form of added sweetener. Artificial flavours and colouring: The ingredients that these synthetic dyes are made up of are linked to several health issues like hyperactivity in children. They are easy to spot on the label because the FDA requires it. Aside from the typical dyes, most industrial caramel coloring is created by heating ammonia and is considered a carcinogen when created this way. Other reasons why bread is bad for you. Here are some healthier forms of grains that will allow you to enjoy the taste of bread without having to worry about all of the detrimental effects of commercial bread. Sprouted grains: Sprouted grains are one of the healthiest alternatives to typical bread because, technically, they are vegetables. To sprout a grain, you just soak it in water until it begins to sprout into a little plant. These sprouts can then be ground up to make bread. When you eat a grain that has been refined into flour, your body metabolizes it the same way it would metabolize sugar, which causes your insulin to spike. This can cause weight gain and can contribute to diabetes and inflammation. This is why it is best to avoid bread that is primarily made from flours. Sprouted grains have many benefits including decreasing blood pressure, fighting diabetes and reducing risk of cardiovascular disease. Read about Ezekiel bread that is made of sprouted grains. Ancient Grains: Ancient grains are packed with nutrients and many of these grains can be used to make gluten-free bread. Examples of ancient grains include: barley, buckwheat, oats, quinoa, millet and rye.